Maybe if her hands hadn’t been tied, she could have checked the text messages he sent her. 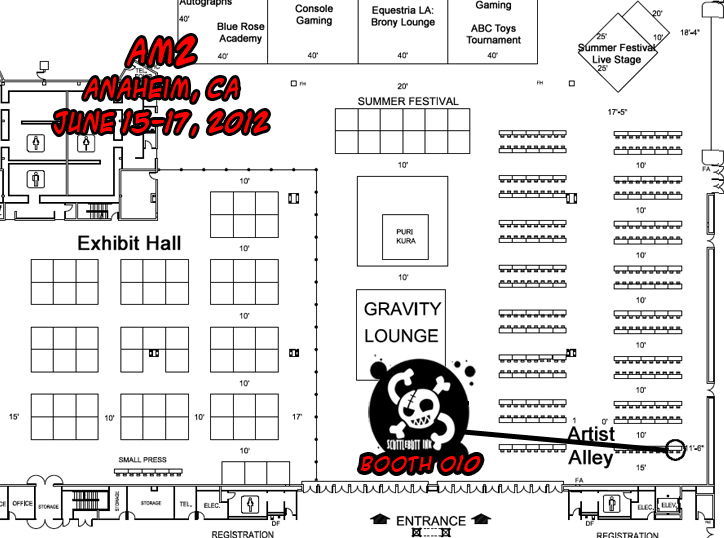 This weekend we’re at AM2 in Anaheim, mostly for the opportunity to see our So. Cal friends. If you’re at the con, be sure to come see us at booth O10! And if you’re NOT at the con and you’re in So. Cal, you should stop by! Attendance it completely free! And now… THIS IS FINALLY OFFICIALLY OVER. On to chapter 5! …But first, it’s book time! 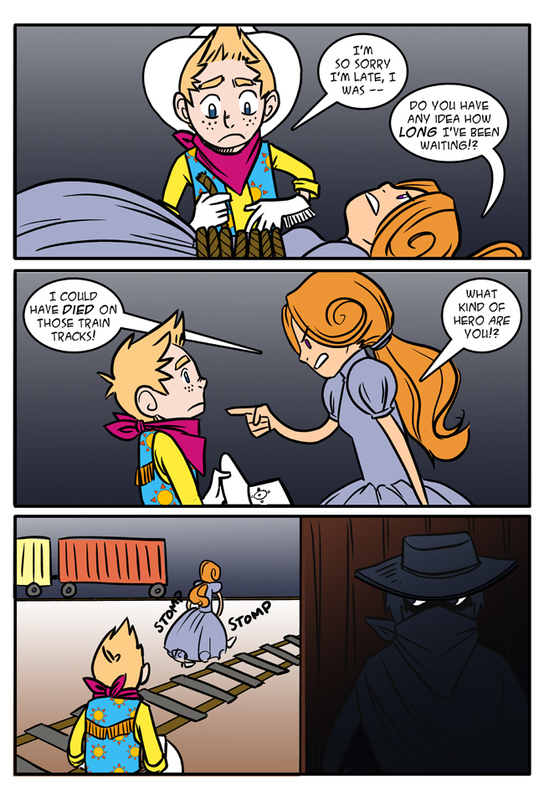 We’re ready to start taking preorders for book 4 comics and things are pretty different this time! We’ll be taking all orders through our web store. There’s a few different options and you do get a special incentive for ordering ahead! We’ll be making bookmarks which come free with all preorders OR you can order the bookmark separately if you just want that! If you want to get all four books, you get the bookmark AND a set of magnets for $24. After the preorders come to an end, you’ll still get the magnets when you order all four — or you can get the magnets on their own! We are offering a VERY limited number of book 4 sketches for $5 which you can add as another item in your cart if you’d like one to be included. If these sell out REALLY fast, we might put some more up. 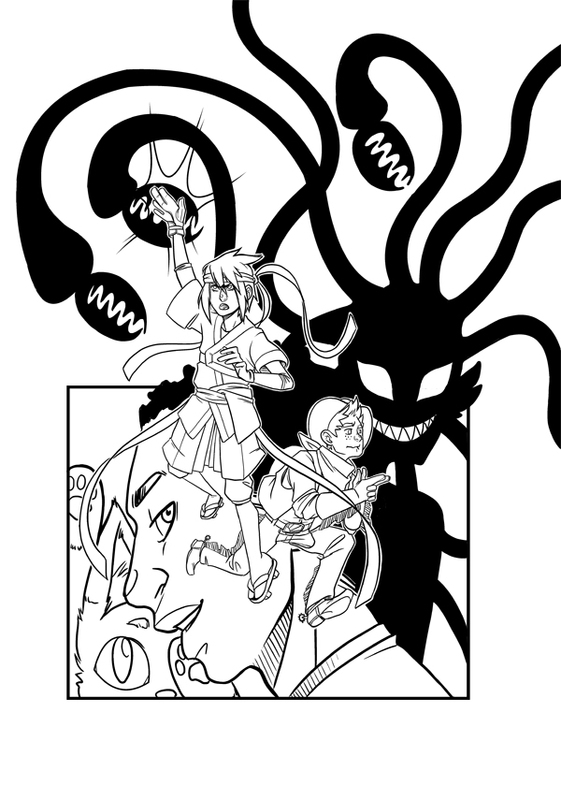 Right now we have the linework for the book cover and the bookmark and we’ll keep you posted on tumblr, twitter and facebook as the images start to come together! We’ll be taking preorders until June 29 — just in time for Anime Expo! Aside from that, we’ve got some good news and some bad news. We’re going to be going on hiatus until at least July 6th while we get the book ready for print, get ready to start chapter 5 AND prepare for Anime Expo and San Diego Comic Con AND try to get all of our commission backlog finished. Summers are always an adventure for us. The GOOD news is that we are THRILLED to announce that we’ve been invited to exhibit with Prism Comics at San Diego Comic Con! If you’re not familiar with Prism, theyre a non profit organization that is all about LGBT comics and their creators and readers. They offer a yearly grant for queer comic creators, publish an anual guide to LGBT comics AND have a fantastic booth at San Diego Comic Con. We’re ironing out the final details but we’ll keep you updated with the final location — AND we’ll be sure to have a Comic Con exclusive or two for those of you who can make it by! Thank you all for your patience and your support as we’ve done chapter 4 of MSF over a very very stressful year. We appreciate you so much and look forward to bringing you the next chapter of our silly story! Welp, I just ordered a bundle. I decided I love your comic enough to toss monies at it! The list of comics I can toss money at is rather short, since I’m poor…but I like to support what I can. I’m super excited to receive it!!! Nevermind, it fixed itself <3 Ignore my prattling. Omg, lol, she is such a crazy girl! But who’s that in the shadows? Btw, seriously gotta consider my money situation before I can preorder. Drat, such a long wait… As as you pointed out, this is the time you have to do stuff for yourselves, sorta. So I can wait. Dear gods how can you guys afford to run to, what, 1-4 cons a month here? Don’t you have jobs and more important things to do than anime conventions all the time? I’m not bitching about lack of updates here, mind, I just genuinely don’t understand where you guys get the funds and time to go to cons all the time. How are you not sick of them yet? If you tell me cons are your main source of income, I will simultaneously call you liars and be jealous. :V Because wtf. It’s the ‘Guapa Gaucho’!! Squeeeeeeeeee!